I’m posting this review up much later than it was actually written, but this trip involved yet another snowy day (sigh why have there been so many) where Jamie and I had been cooped up inside the house and decided we wanted to treat ourselves to dinner out. I’d been eyeing up the vegan burgers at Brewdog since we’d been for drinks there with work a couple of weeks previously, so we ventured down to Cowley Road to consume an unjustifiable amount of calories. Somewhat foolishly, we hadn’t considered the fact that it was St Patrick’s Day. We stepped inside the fairly cosy bar and at a first glance it looked like we might be out of luck with the seating. At the long bench at the back though we found two stools to perch on until some people left and we had a more comfortable space to sit and eat. It was only 6.30pm or so, but I was surprised at just how many small, and very small, children there were running around the bar. Irish folk music was playing loud enough that you couldn’t really hear the children, though I’m not sure which of the two I would’ve found more grating. Anyway, putting aside my miserable self, Brewdog has a lively atmosphere which seems pretty inclusive to everyone. Jamie placed our order at the bar and we both opted for a fizzy soft drink while we waited for our food. I asked Jamie to grab me a pink bottle, which I expected to be grapefruit, but when it got to me the Fritz-Spritz turned out to be an organic sparkling rhubarb drink. Luckily I love rhubarb, and this went down so well. It was a refresh balance of sour and sweet. Jamie ordered a coca cola alternative from the same brand. 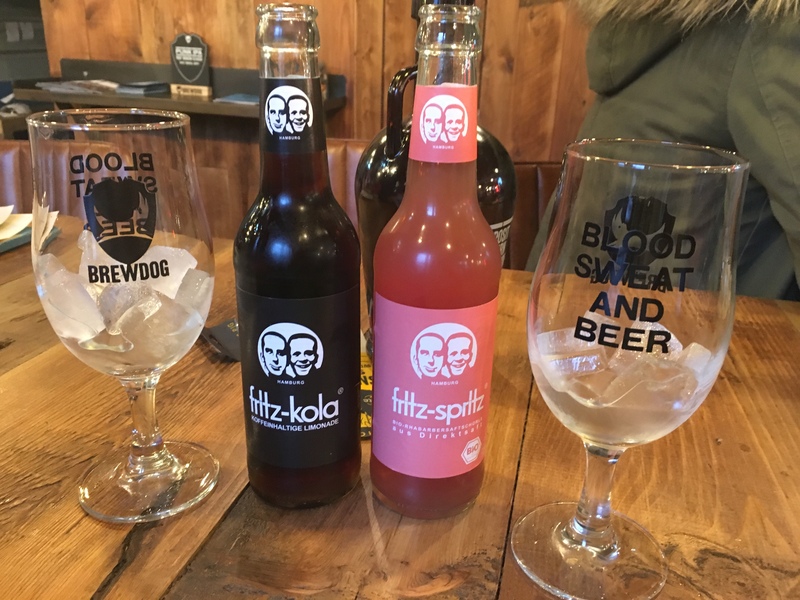 All the Fritz-kola were labelled vegan. When our food came out, it appeared there had been some crossed wires between the person at the bar taking our order (was the music too loud, or did he just not even understand the fact that some of the Brewdog burgers were vegan? We’re still not really sure). What arrived was a seitan burger in a non-vegan brioche bun with dairy mayo on one board, and a vegan burger on the other, with a side of actual chicken wings. Before I even noticed the chicken wings I mentioned that the vegetarian burger should have been vegan, we were apologised to, and the meal was sent back. A couple of seconds later, the person serving us, who we think was a manager, came back to ask ‘can I just check, the other burger, it was a side of chicken wings you wanted wasn’t it?’. I think he knew what the answer was going to be before he asked the question. He collected up the other board and assured us our meals would be cooked fresh (which we just have to trust was the case). To the credit of the staff, our food order didn’t take too long to come out the second time. 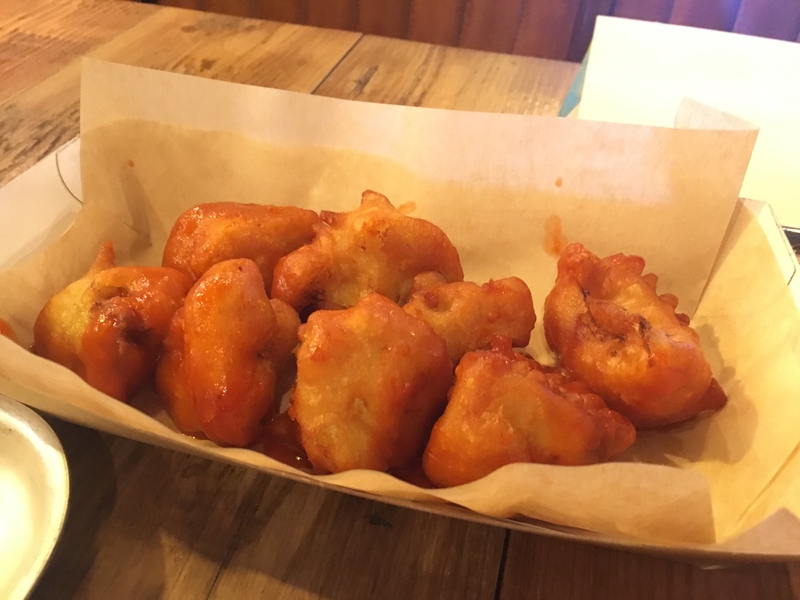 We had ordered cauliflower wings to accompany each burger, and a big side of sweet potato fries, but instead we got two small sweet potato fries and one big bowl of cauliflower wings. It can’t have worked out as much of a difference so we didn’t bother mentioning. We were pretty hungry at this point so just happy to have some good looking vegan food in front of us. The manager also kindly gave Jamie a £5 voucher to say sorry for the mix up with his order, which we thought was nice service, as we’ve been to many a restaurant where the staff are pretty unapologetic. I’d ordered the Hail Seitan burger, a BBQ seitan steak served with hummus and kale. The burger itself was very meat-like, so much so that I had to check there wasn’t a meat version of the same burger on the menu as I was worried they’d got it mixed up again. But no, it was definitely seitan, and the texture and BBQ flavours were pretty spot on. 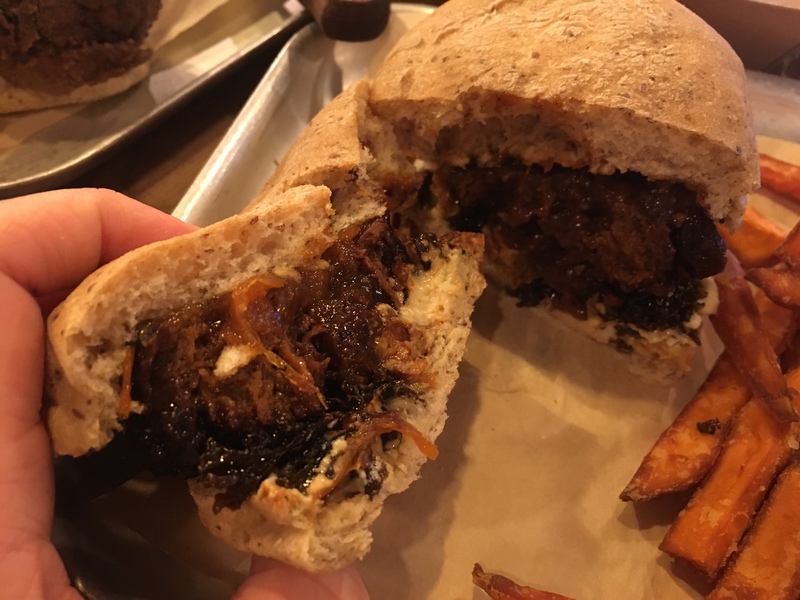 I was kind of unsure about hummus and kale in a BBQ burger but the chargrilled greens and creamy, tangy hummus balanced out the sweetness from the sauce nicely. I did find the BBQ sauce almost overly sweet and combined with it being so filling, I struggled to finish it off. Jamie had gone for the vegan version of the Clucky This Time, but he’d also ordered it without avocado, which he doesn’t like. I felt it was a shame because I love avocado, and in the end we both agreed the burger definitely needed it as it was quite dry without the mayonnaise either. I did find myself wondering whether they might stretch to buying a £2.50 bottle of vegan mayo from Tesco anyway (or presumably even cheaper if you’re buying in bulk from somewhere), if they’re going to go to the effort of putting proper vegan burgers on their menu. The fake chicken was enjoyable enough and I actually still preferred this burger to the one I’d ordered, but for Jamie, he preferred the BBQ burger. Either way, we both agreed with certainty that the best spot on Cowley Road for a junk food burger is still Happy Friday Kitchen. 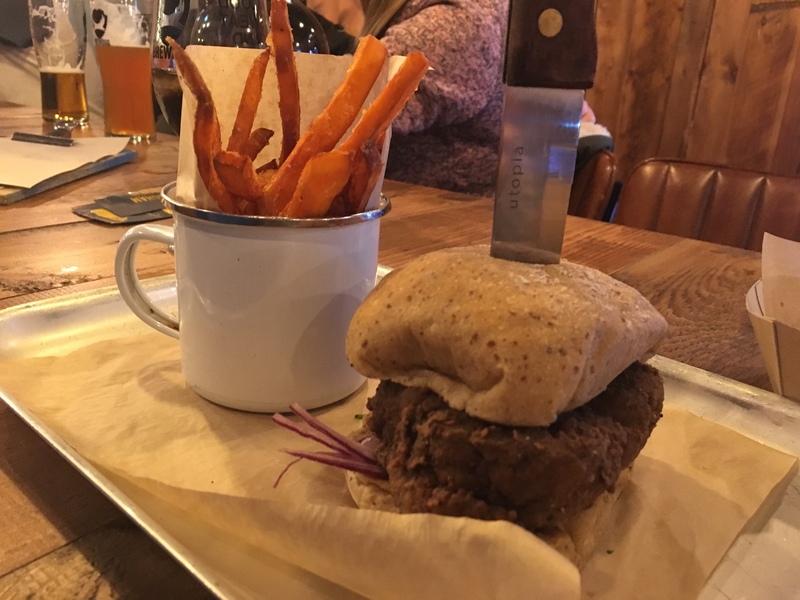 Perhaps unsurprisingly, while the Brewdog burgers were pretty good, they just didn’t quite reach the level of Oxford’s vegan comfort food joint. Our side of the cauliflower wings were tasty, and again it was nice to have an alternative to the meat option on the menu. The hot sauce they were smothered in was a bit too spicy for me. The crispy batter was good but we found ourselves missing a bit of seasoning on the cauliflower itself, some additional salt and pepper wouldn’t have gone amiss. The skinny sweet potato fries were spot on though and I’d definitely choose to use Jamie’s voucher on a big side of these next time if I had a say in it! Overall, the food was enjoyable and it’s great to see decent vegan options integrated into the menu without fuss. I imagine the mix up with our order was a rare occurrence and in any case they handled it pretty well. Brewdog probably wouldn’t be my first choice for a meal out, but it’s bar food, and as far as that goes, I really couldn’t complain. Its a chilled place to come out for a drink and even better for knowing that you can grab a bite to eat too if you fancy it. I figure there will be a lot more after-work drinks arranged here in the future. I’ve seen they also have a pretty delicious looking vegan brunch option so a weekend morning visit wouldn’t be out of the question either!